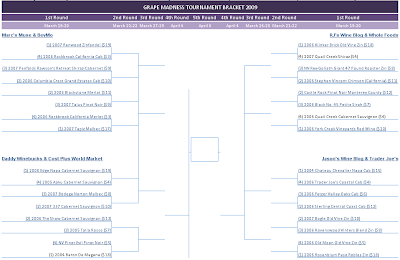 The Wellesley Wine Press: Grape Madness: Submit Your Bracket Now! Some really cool fellow wine bloggers have gotten together and have done a mash-up of March Madness and wine. The result? Grape Madness! Head on over to check out the bracketed head-to-head competition they've set up and submit your entry by the end of the day Wednesday March 18th, 2009. The guys running it are some of my favorite wine bloggers on the Internet. I love the angle of having the brackets based on stores. We can talk all we want about specific wines, but at the end of the day we have to buy wines somewhere. That additional piece of intrigue adds to the interest of the competition: Which store will produce the winning wine? It's always fun to mix sports and wine. For me, hunting for wines has so many parallels to collecting baseball cards it's ridiculous. My only questions is this: Where's the Costco bracket? Maybe next year. I'm taking the Columbia Crest Grand Estates Cab to go all the way. What else would I pick? I'm a huge fan of Columbia Crest and especially their Grand Estates line. For me, it's an easy to remember, readily available, consistent label (across many varietals I might add) that always produces value. Question of the Day: What's your pick to win? Which store and which wine?